Are you looking for a career with us at The National Lobster Hatchery? Check our updated job list below and look to be part of this team of dedicated, motivated and fun staff. Please do check on a regular basis so not to miss out, or give us a call on 01841 533877 to discuss. Thank you for your interest in working with us at the NLH. There are currently no job vacancies. Please check back on a regular basis. Our visitor centre team are essential for communicating our conservation and research work to the general public who visit us at our Padstow headquarters. As a volunteer you'll join a small but dedicated team who are passionate about the work we do and help inspire our visitors to love lobsters (and other sea life!) by engaging visiting members of the public. A background knowledge of marine biology and conservation issues is advantageous but not essential as we can provide full training. A commitment of 6 months is preferable, however we can be flexible and may consider candidates who can only help for a shorter period of time. 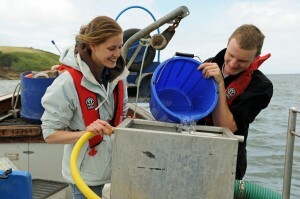 An interest in marine conservation is needed but full detailed training is provided! Our hatchery operations are conducted by a dedicated team of marine technicians who deal with the day to day running of our hatcheries, facilitating our lobster restocking conservation programme and supporting cutting edge research. We are able to offer a small number of opportunities to volunteers to assist the team with tasks relating to animal husbandry and aquaculture systems maintenance and enhancement in the hatchery. Please note: In order for volunteers to gain the best possible experience from this role we ask you commit to at least 6 months for a one day a week volunteer placement. You may be asked to attend an interview as part of our selection process. A qualification in a relevant science which includes marine biology, issues of sustainability or fisheries management is preferred but not essential. These roles are not paid and you must be over 18 to work with the hatchery team. Unfortunately we are unable to offer any financial support or cover travel costs. Our team of researchers are involved in some of the most pioneering European Lobster research anywhere in the world. We are able to accommodate a small number of student research projects focussing on the subject of European Lobster aquaculture, biology or fisheries which would benefit from the use of our facilities and the experience and knowledge of our scientists. These projects would usually be conducted as a joint venture between ourselves and the university of the student and are best suited to third year BSc students or Masters/PhD projects. Please note: These roles are not paid and you must be over 18 to work with the research team. Unfortunately we are unable to offer any financial support or cover travel costs. Charlotte Preston started volunteered with us to gain relevant work experience, having graduated from an Environmental Tourism & Sustainability degree. Months later, we were able to offer her paid work through the Access to Work Scheme to support a member of our research team in the hatchery. She was undertaking mirco-biological analysis of lobster larvae & water samples and morphometric analysis of larvae & juveniles for our Framework 7 Research project. She also gained practical experience of husbandry techniques and the life support systems within the hatchery. With her new found practical experience and a glowing reference, Charlotte gained full time employment in 2011 with the National Marine Aquarium in Plymouth as an Aquarist and Diver.